"The war changed many things; the face of the earth and the people on it. Before the war, Frank Race worked as an attorney, but he traded his law books for the cloak-and-dagger of the OSS. And when it was over, his former life was over, too...adventure had become his business!" Yes, Frank Race was a lawyer before the war. Now, his life is filled with intrigue. To the strains of organ music, he travels to exotic locales on cases of international insurance scams, and more. 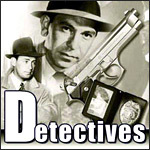 This adventure series aired from 1949 to 1950, with Tom Collins and Paul Dubov as Race. The role of sidekick Mark Donovan was played by Tony Barrett.